This post was commissioned by Graham Christensen as part of the Great Slate fundraiser. Thank you! This was a bit of a challenge, given that I didn’t even know what Nix was. I had never used it and still haven’t, nor can I use it for the near future, because my only computer right now is a Windows box.1 Fortunately, “something” has a lot of leeway and I quickly found a topic I could write about. Nix claims it’s a “fully-functional” package manager. What does that actually mean? Buckle up everyone, it’s time for some formal methods. We’re going to specify a bunch of theoeretical package managers and show what benefits (and possibly drawbacks) a “fully-functional” package manager has. Okay, let’s begin. You can download Alloy here if you want to follow along. If this is your first experience with Alloy, I’d recommend reading my introduction first, since it explains all of the terms I’m using here. All packages are divided into two types: Programs are packages we try to install. 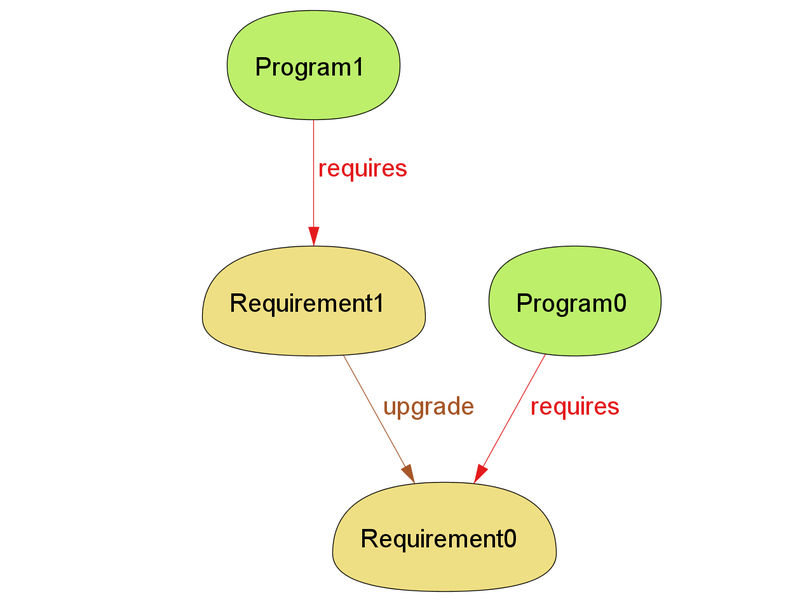 Requirements are packages that a program requires. Requirements don’t require anything. All packages may or may not have an upgrade. Upgrades are linear and acyclic: at most one thing upgrades to any program, a program can’t eventually upgrade into itself, etc. Upgrading cannot change a requirement into a package or vice versa. The set of all programs in a given list of upgrades is called the program version. There’s no horrible cycle nonsense: a program can’t require something and its upgrade, require its own upgrade, etc. Most of these are implicit in the prior two assumptions, but if we loosen them, this one should still hold. Time will be our trace. Package has two facts on it: at most one thing upgrades to it, and it can’t require its own upgrade. @ is a workaround to avoid expansion in signature, since otherwise Alloy will replace upgrade with this.upgrade. The functions just give us versions as a niladic relation instead of a monadic function. And we enforce the cycle restrictions as facts, so they cannot occur in any solutions. It can only get one package in a single step. If there are any missing requirements, either update or install them. This may take several steps. If there is no version of that package installed, install the package. If there is a prevision version of the package installed, “upgrade” by removing the old package and installing the new one. This means that if a package has two requirements, we can get it in three steps: install requirement A, install requirement B, install package. Our rules also mean you can only have one version of package at a time. Some of you are already cringing. Everybody else is going to see why this is a bad idea soon enough. Finally, we have an assertion we want to check. The one I will use is that if a package is installed, then all of its requirements must also be installed at all times. Otherwise, we have a requirement breakage. You can probably see where this breaks. P1 requires R1 but P0 requires R0. Once we upgrade R1 -> R0 then P1 no longer has all of its requirements installed.3 This is why most some package managers don’t actually upgrade files that way. Instead, they simply install both versions. One of the claimed advantages of Nix is that, as a purely functional package manager, it’s pure: the success or failure of a build does not depend on prior builds.4 To see why this is an advantage, let’s explore how a build is actually produced. The developer will manually list the requirements a package needs and then upload it; when the user installs the package, it also installs the requirements. But can we guarantee that, if it works on the developer’s machine, it works on the users? One way we can check is to step outside the bounds of simply representing the package manager and start representing a “simulation” of the wider environment. What we’re going to do is implicitly define another user by adding a dependent inventory. We also create an explicit relation that is whatever packages the developer had to install to match the requirements. First the developer installs the requirements. Whatever she installs will be the explicit for the package. When the user tries to install the package, she also installs everything in explicit. In all cases, this shouldn’t cause a bug. Let’s represent it. I want to call special attention the p.explicit = ... line in install. It looks like an assignment, but that’s me abusing the notation. Predicates don’t set values. They’re just statements that are true or false. If install[t, t', p] is true, then p.explicit = ... must also be true. That ‘acts’ like an assignment. If install[t, t', p] is false, then we don’t know anything about p.explicit. It might be nothing, or it could be every single Requirement in the model. Alloy is free to do whatever it wants with it. That’s why we have p in installed.t in install_to_dependent. Based on our model, p in installed.t is only true when install[t, t', p] is true, which is only true if p.explicit is behaving nicely. So by adding that extra line to install_to_dependent, we’re only checking the model when we have the expected explicit. Developer builds P1, which consists of R0 and R1. P1.explicit = R0 + R1. User installs P0. She’s missing a requirement, and our assertion is violated. One way to fix this is to simply set explicit = requires. But that’s a cop-out: it presumes the developer knows all of the packages needed in advance. We’re trying to make sure this works even when the developer makes mistakes! Let’s try a completely different tack. Instead of changing how we calculate the requirements, we can change how the package manager tracks installations. Up until now we’ve simply made installed pairs of packages and times. Let’s instead make it a triple: one package, one program, and a time. The program is whichever one the package was installed for. -> here is the relation operator: p -> p is the relation that maps p to itself. p -> (p + p.requires) is equivalent to writing (p -> p) + p -> p.requires. Finally, we have to change the assertion to accurately pull the requirements out. When we run this, there’s no more errors! This is because the developer can’t get away with having just the requirements on her computer. Since we’re installing requirements as coupled to the appropriate program, she must install a complete copy of every requirement in order to get the program. 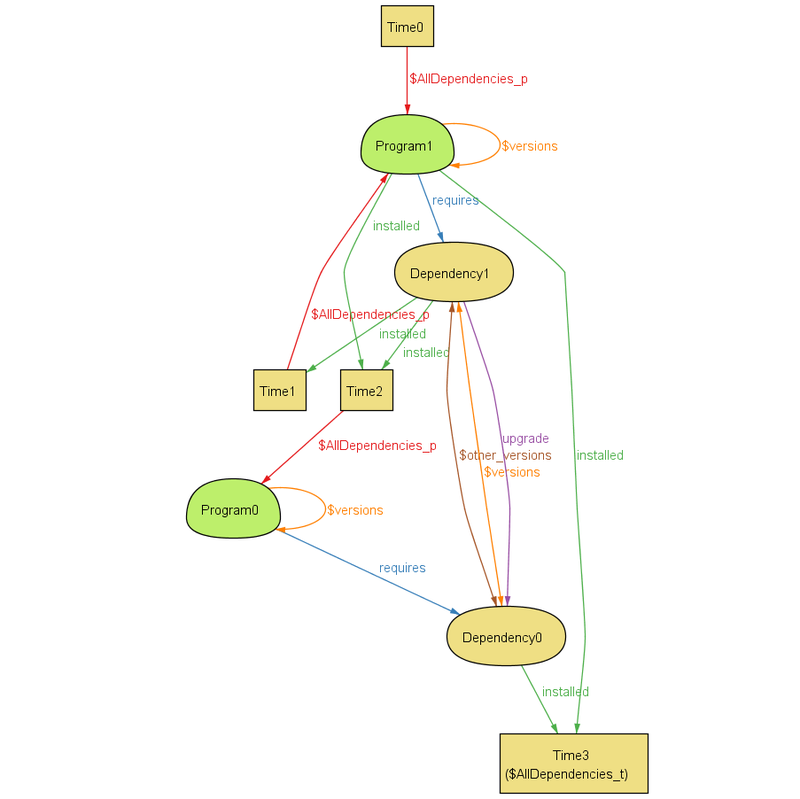 This means her explicit dependencies always match the actual requirements. This is exactly how Nix does it. By keeping all of the requirements isolated, you have a deterministic build. If it works on your machine, it should (ideally) work on other machines regardless of their current state. What happens if we allow our Requirements to have requires? Does everything still work? If not, how can we fix it? Nix has a feature called profiles. If you have two packages for python, the user might only want to see one at a time, so they can do python bar.py and not vp969yhdq-python bar.py. How could you represent this in Alloy? Nix also has a feature called rollback, where you can return to a previous Time. What properties are worth checking about rollbacks? Does Nix’s structure help here at all? Remember that we can create predicates on t.prev or t.next.next. Programs often have ranges as requirements. For example, it might work with any one of versions 2, 3, 4. How could you represent that? It might be similar to something we do here. I didn’t actually try any of these so they might be trivial or impossible. Have fun! But I think this also underscores just how powerful formal methods are. The “upgrades are tricky” case came up within a few minutes of me starting the spec. I’ve noticed similar things with TLA+ and even informal graphviz modeling: just having a way to clearly think about your system makes a huge difference in the overall quality.